While there are many libraries and frameworks that work directly with Tiled maps, Tiled also supports a number of additional file and export formats. Exporting can be done by clicking File > Export. When triggering the menu action multiple times, Tiled will only ask for the file name the first time. Exporting can also be automated using the --export-map command-line parameter. Several Export Options are available, which are applied to maps or tilesets before they are exported (without affecting the map or tileset itself). The JSON format is currently the only additional format supported for tilesets. Maps and tilesets can be exported to Lua code. This export option supports most of Tiled’s features and is useful when using a Lua-based framework like LÖVE (with Simple Tiled Implementation), Corona (with ponytiled or Dusk Engine) or Defold. Currently not included are the type of custom properties (though the type does affect how a property value is exported) and information related to recent features like Wang tiles and object templates. The CSV export only supports tile layers. Maps containing multiple tile layers will export as multiple files, called base_<layer-name>.csv. Each tile is written out by its ID, unless the tile has a custom property called name, in which case its value is used to write out the tile. Using multiple tilesets will lead to ambiguous IDs, unless the custom name property is used. Empty cells get the value -1. GameMaker: Studio 1.4 uses a custom XML-based format to store its rooms, and Tiled ships with a plugin to export maps in this format. Currently only orthogonal maps will export correctly. Tile layers and tile objects (when no type is set) will export as “tile” elements. These support horizontal and vertical flipping, but no rotation. For tile objects, scaling is also supported. The tilesets have to be named the same as the corresponding backgrounds in the GameMaker project. 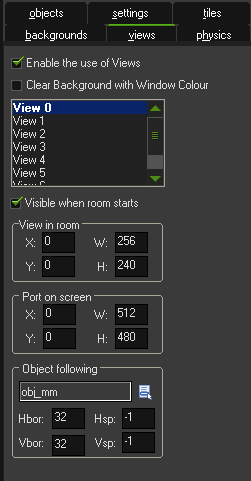 Otherwise GameMaker will pop up an error for each tile while loading the exported room.gmx file. GameMaker object instances are created by putting the object name in the “Type” field of the object in Tiled. Rotation is supported here, and for tile objects also flipping and scaling is supported (though flipping in combination with rotation doesn’t appear to work in GameMaker). The scaleX and scaleY properties can be used to override the scale of the instance. However, if the scale is relevant then it will generally be easier to use a tile object, in which case it is automatically derived from the tile size and the object size. The originX and originY properties can be used to tell Tiled about the origin of the object defined in GameMaker, as an offset from the top-left. This origin is taken into account when determining the position of the exported instance. Of course setting the type and/or the above properties manually for each instance will get old fast. Since Tiled 1.0.2, you can instead use tile objects with the type set on the tile, and in Tiled 1.1 you can also use object templates. Views can be defined using rectangle objects where the Type has been set to view. The position and size will be snapped to pixels. Whether the view is visible when the room starts depends on whether the object is visible. The use of views is automatically enabled when any views are defined. When you’re defining views in Tiled, it is useful to add view as object type in the Object Types Editor, adding the above properties for ease of access. If you frequently use views with similar settings, you can set up templates for them. The tBIN map format is a binary format used by the tIDE Tile Map Editor. tIDE was used by Stardew Valley, a successful game that spawned many community mods. Tiled ships with a plugin that enables direct editing of Stardew Valley maps (and any other maps using the tBIN format). This plugin needs to be enabled in Edit > Preferences > Plugins. It is not enabled by default because it won’t store everything (most notably it doesn’t support object layers in general, nor external tilesets), so you need to know what you are doing. The tBIN format supports setting custom properties on the tiles of a tile layer. Since Tiled does not support this directly, “TileData” objects are created that match the location of the tile, on which such properties are then stored. Tiled can export a map to a Defold Tile Map (*.tilemap). This component only supports tile layers and only a single tileset may be used. The plugin is disabled by default. Upon export, the tile_set property of the Tile Map is left empty, so it will need to be set up in Defold after each export. When any additional information from the map is needed, the map can be exported in Lua format and loaded as Defold script. These plugins are disabled by default. They can be enabled in Edit > Preferences > Plugins. It is also possible to write Python scripts to add support for importing or exporting custom map formats.